Ramdas is the Senior Teacher at Bhakti Houseand has dedicated his life to the practice and teaching of yoga. 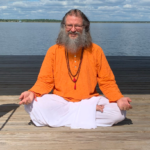 He’s taught yoga for 17 years and has been recognized as a Senior Teacher of the Amrit Yoga Lineage by Yogi Amrit Desai. The journey of yoga that Ramdas has followed led him out of the darkest depression. He now focuses on making the ancient secrets of yoga available for practical use in our everyday lives. Ramdas is the author of LIVE FREE (available January 2019) and the online courses at LiveHappy.us. Monica is the Program Director at Bhakti House. She began practicing yoga in January 2010 and was immediately hooked. Yoga has completely changed and improved the quality of her life. On the surface, practicing yoga helped her lose and keep off more than 100 pounds. More importantly though, Monica will also tell you that yoga taught her to accept and love herself as she is. She’s now a 500 hour registered yoga teacher and teaches yoga, Yoga Nidra, and meditation classes. Monica believes that every body can do yoga and experience the full benefits of yoga. Size doesn’t matter. Age doesn’t matter. How bendy you are doesn’t matter. Feeling good in the body you have matters. Feeling less stress matters. Feeling more peace matters. Feeling good about yourself matters. Monica also teaches Hebrew language and culture at Brigham Young University. She enjoys reading, hiking, gardening, bubble baths, and dark chocolate. Radhika is the Director of Recovery Services at Bhakti House. She first met Ramdas in the fall of 2012 and fell in love with Yoga Nidra. She has since used the practice to help herself and countless others to remain sober and overcome addictions, anxiety and depression. Radhika is not only has a passion for yoga, she also loves the outdoors and can often be found at the hot springs leading clients and friends in meditation.